This week, Gawker–the website that has brought us such gems as “The Top Nine Videos Of Babies Farting And/Or Laughing With Kittens” and “I Can’t Stop Looking at This Weird Chinese Goat“–published an article with the headline “Do Not Give a Dollar to the Opera.” I have copied and pasted the “meat” (read: three-day-old cafeteria mystery loaf) of the article below. Do not feel obligated to click on any of the above links, as page views are the lifeblood of Gawker. I have only linked to these stories to prove they actually exist. In “Do Not Give a Dollar to the Opera,” Hamilton Nolan–who has brought us such gems as “Most Households Bizarrely Still Have a Landline” and “The Scariest Man Alive Wears A Cardigan“–basically copies a few of the questionable ideas from this New York Times article and puts it in a convenient bullet point list. The list is below. My rebuttals are in bold. Opera may not be your cup of tea, or mine, but opera is some people’s cup of tea, and it can be great, as an art form, just as all other art forms can be. In general, a flourishing and diverse art scene in a city is a good thing. Not a bad start. My only quibble here–other than the innate preciousness–is the phrase, “In general,” which implies, “Usually, but not always…” But I say “a flourishing and diverse art scene” is always a good thing. However, in a world of limited money and resources, we must make choices. A dollar given to one cause is a dollar not given to another cause. The relatively small number of people wealthy enough to give large sums of money to charitable causes are in high demand. The need of charitable causes for funding far exceeds the available funds at any given time. Translation: Because there isn’t enough money in the world to solve all of the world’s problems, we should not contribute to any of them. As the New York Times reports, the New York City Opera’s financial situation has been in decline for years. It is far from being able to support itself financially. It is fully a charity, not a going concern. Translation: Because NYCO has had financial challenges, we should not support them. In return for $20 million in charitable donations, the New York City Opera will produce three operas this season, and another season of operas next year. Six operas for $20 million over two years? That’s actually quite thrifty. 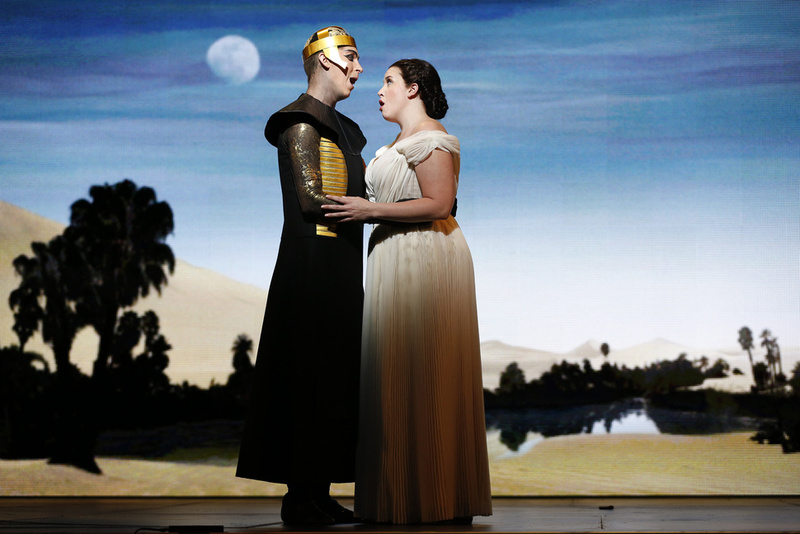 LA Opera’s $37 million annual budget will cover eight operas this year. (Hey…if Mr. Nolan gets to grossly oversimplify the finances of a major arts organization, I can too, right?) And in case you were tempted to ask why opera costs so much, here’s a link to my post on fair pay for musicians. Could that same $20 million in charitable donations be better spent elsewhere? Well, if you believe that saving human lives is a better use of money than producing operas, then yes. That money could purchase nearly seven million anti-malaria nets through the Against Malaria Foundation, which is rated as the world’s most effective charity by the ethical philosopher Peter Singer. Singer’s group estimates that a human life is saved for every $1,865 donated to the AMF. So, for the cost of producing one and a half seasons of opera in New York City, more than 10,000 deaths in developing countries could be prevented. This just makes me irritated. But then employing fallacious reasoning generally makes me irritated. What’s being suggested here is that one should never spend any disposable income on anything besides saving lives. By this logic, I should hope Mr. Nolan refuses to spend any of his money on a monthly Netflix subscription, never treats himself to a weekend away, never orders an extra drink at the bar, never goes to see a movie, doesn’t own an iPad, never rides the subway or takes a cab or flies on an airplane. And I should hope that every few weeks…or couple of months…or however long it takes Mr. Nolan to save the $1,865 it takes to save a life, he would do just that with his $1,865 and leave the extravagance and moral depravity to the rest of us. Perhaps the charitable donors who might give money to the New York City Opera are only interested in causes here in New York City. In that case, consider the fact that there are currently more than 50,000 homeless people in our city. A donation of $20 million to, for example, the Coalition for the Homeless could go a long way towards addressing the needs of those in crisis. This is the same argument as the last bullet point, except for the geographical restrictions. Yes, using your money to make the lives of others better ought to be an integral facet of one’s existence. The arts are part of that. There are many things in this world that are all well and good, but that are not the best uses of charitable donations, which are a precious and limited resource. When charitable resources are limited, they should be put towards the most pressing needs. Saving human lives or helping the homeless are just two examples of needs that are more pressing than producing one and a half seasons of opera in New York City. Saving human lives and helping the homeless are important and worthy causes. But to frame this question as an either/or scenario misses the point completely. Earlier Mr. Nolan mentioned he thought “a flourishing and diverse art scene” was usually a good thing for a city. He also stated that, opera wasn’t his “cup of tea.” Had he gone on to say, “because I am not inspired by opera, I choose to not support opera financially,” I wouldn’t have a problem with his stance. After all, we are each free to choose how we allocate our own support for charities and non-profit organizations. But instead, Mr. Nolan has chosen to engage in ideological proselytization (“I have this opinion and so you should also”). The fact is, opera does inspire many of us. It takes us to places we couldn’t have even imagined otherwise. It captures our emotions and challenges our preconceptions. We learn creativity, self-expression, discipline, excellence, perseverance, patience, respect, community, and so many other important aspects of life from opera. We discover ourselves in the stories: our struggles, our aspirations, our failures and successes. Opera teaches us how to be better human beings. No, it may not be everyone’s “cup of tea,” but that doesn’t mean it should disappear forever. Opera may not be practical, but the most rewarding pursuits in life rarely are. Our society is more vibrant when it exists in places other than the “bottom line.” We are a stronger community of human beings when we are not all the same; and when our differences are somehow (strangely, magically) afforded the power to bind us together. My parting shot is this video: one of my favorite moments in all of opera, sung by one of my favorite singers of this generation. If you fail to be moved by this music, check your pulse. If you still don’t like opera afterwards, well, that’s fine. Just don’t try to ruin it for the rest of us.